Isagenix Shake and Shot Pack - Buy Direct in UK & Save! Isagenix Shake and Shot Pack £ £126.00In stock! Order now! Are you ready to start living the life you crave? The revved up Isagenix Shake and Shot Pack may be just what you need. Designed to help fuel your muscles and maximise your energy with premium protein, superior plant-based caffeine, adaptogenic botanicals, and other scientifically-proven ingredients, this unique Isagenix pack gives you exactly what you need to reach your fitness and performance goals. Download the Isagenix Energy & Performance Guide for more information on how this pack works, a daily planner, the results you can expect and more. The leading scientists and nutritionists at Isagenix developed each of the products in the Shake and Shot Pack to provide everyone from pro athletes to stay at home mums with the premium fuel they need to maximise their workouts and be the very best versions of themselves they can be. 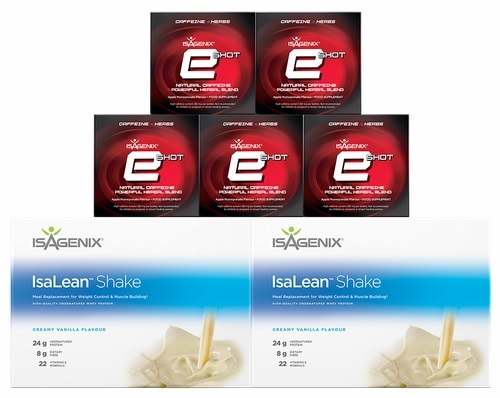 Featuring a bounty of IsaLean Shakes and e-Shots, the Isagenix Shake and Shot Pack has plenty of powerful protein and natural caffeine to fuel your workouts and day to day activities. The Isagenix Shake and Shot Pack is designed to do two things: get you moving and your muscles pumping. However, it just so happens to fuel fat loss as well. By incorporating IsaLean Shakes and e-Shots into your daily routine (along with working out of course) you’ll shed stubborn kilograms in no time at all. With an impressive 24 grams of premium undenatured whey protein in each and every serving, the IsaLean Shakes in the Shake and Shot Pack are designed to maximise your workout efforts and lean muscle growth. The Isagenix Shake and Shot Pack was designed to support optimal nutrition, fuel lean muscle growth and help you reach your full potential. If performance and results is your top priority, this is the pack for you. The natural, plant-based caffeine in Isaegnix e-Shots will help boost your energy and mental alertness. Not only will you be able to enjoy prolonged energy, but you’ll avoid the dreaded crash associated with traditional energy drinks as well. In addition to superiorly sourced caffeine, the Isagenix e-Shots included in the Shake and Shot Pack contain powerful adaptogenic botanicals proven to focus your mind, reduce the effects of stress, and take your daily performance to new heights. By regularly taking both as part of an Isagenix performance programme, you’ll experience improved performance, a slimmer waistline, more muscle tone, and the energy to power through the most challenging of days. What Makes the Isagenix Shake and Shot Pack So Unique? Unlike many of the other Isagenix packs and systems offering a wide-variety of cleansing, weight loss, and performance products, the Shake and Shot Pack only provides a select two. However, these two products provide you with the very best nutrition and fuel, allowing you get the most from Isagenix’s cutting-edge research and development. If you’re focused and determined to achieve peak performance day in and day out, this is the pack for you. How Much is the Isagenix Shake and Shot Pack? Preferred Customer on Autoship =£126.00 sign up fee. Sign up to the Autoship programme to have access to the cheapest wholesale prices year round and get your Isagenix programme delivered straight to your door every month. Autoship can be cancelled at any time, even after you take advantage of the cheaper prices on your first order! There are no locked in contracts of any sort. Preferred Customer =£133.00 sign up fee. You can still get access to cheaper than retail prices, however this option will cost more than signing up to the autoship programme. Customer =£159.00. No annual fee and you’ll save 10% off full retail prices. By being on autoship you’ll save an additional 5% on any pack or system. Full Retail =£177.00. If you prefer not to sign up for autoship or pay an annual fee, you can purchase the products at full retail price. Read Isagenix Shake and Shot Pack reviews from real Isagenix UK customers! 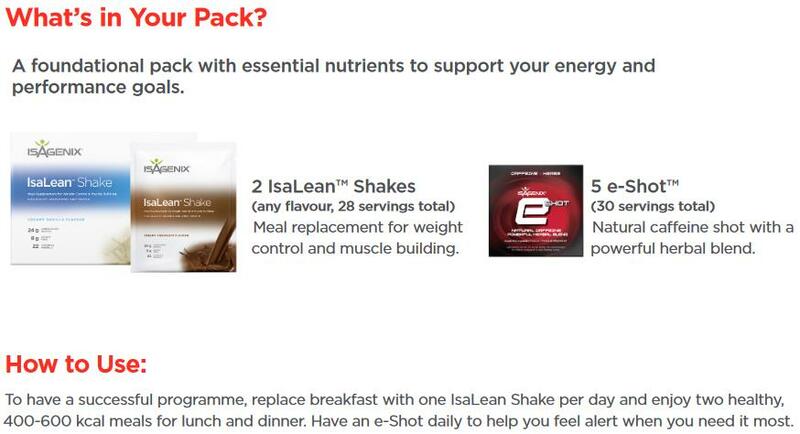 This pack is my preferred as I really only use the Isagenix Eshots and Shakes now. Convenient and have noticed that the shipping times have improved in the last 2 months too.